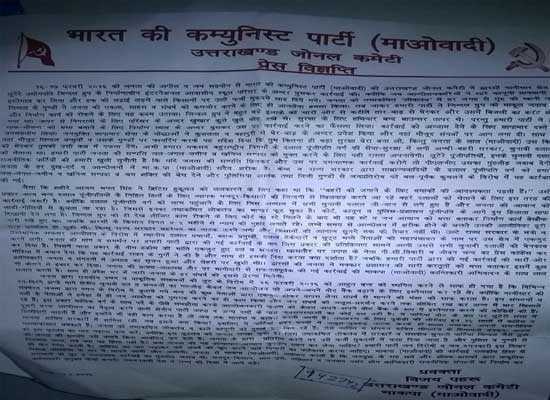 Fight against the aerial attacks on Bastar! For the past six months MI-17 war helicopters have been practicing firing and bombing drills in Sukuma, Dantewada and Bijapur of South Bastar in Chathisgarh. On the 1st of April top officials of the police and airforce announced in a press meet that in the situation where Maoists fire on the security forces, garuda commandos would return fire. This means nothing but in any case there would be aerial firing and bombing. In fact the government armed forces are firing daily in the struggle areas. In the name of Maha Abhiyan there are fake encounters and encounters each and everyday. Indiscriminate arrests are going on. Last October the police lied that helicopters would be used only for relief operations and that they would take up aerial firing only when the helicopters are targeted by the Maoists and only as self defence. There is not a single incident of firing on helicopters in the last six months. Inspite of this the government is up to aerial firing and bombing as a part of the fascist military repressive campaign greenhunt. Talking about self defence is only to mystify the people of the country. The fact is that the airforce is given absolute authority to make aerial attacks. It means, the struggle of the people against their displacement by the proposed mega mining, mega dams, mega factories and the Maoist party, PLGA, mass organisations and the revolutionary masses leading the struggle be speedily crushed and the jal, jungle and zameen and resources be handed over to the domestic and foreign corporate companies for loot. Apart from the existing tens of thousands of police and para military forces, the decision for aerial attacks is for this purpose. The secret project hidden behind the permission of the Central Government for the construction of aerodrome in the Indravathi Tiger Reserve is that to transform this National Park into an air base. The struggle of the Dandakaranya people is not only for their sake. This is the struggle of the oppressed masses of the country. This is the struggle to protect the resources for the future generations. It is to protect the environment. It is to protect the rivers, streams, forest and land. The unjust war of the central and the state governments-Operation green hunt is only and only for the profits of the corporate companies. This is time to raise for the oppressed masses, revolutionary parties, democratic, progressive sections, trade unions, human rights organisations, writers, artists, historians, film makers, lawyers, students, print and electronic media personnel, tribal and non-tribal social organisations. Our party appeals to all to raise voice against the aerial attacks and bombing. We appeal to take up a campaign to not let the air force meant for countering the foreign attacks and occuptional wars to take up operations inside and on the people of, the country. 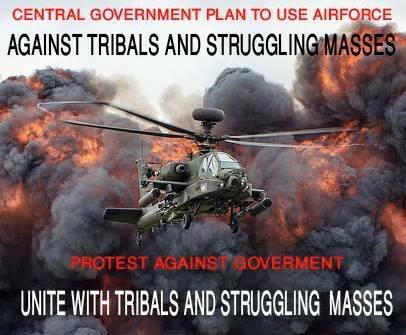 Fail the conspiracies of the governments that would destroy the identity of the ancient tribals of the country. Our party appeals to the people of Chathisgarh and Maharashtra to make success the Dandakaranya (Chathisgarh and Maharashtra) bandh on 15th April in protest to the proposed aerial firing and bombing. Special note– Education and health services would be exempted from the bandh.